Proverb cloths, called leso, kanga (khanga), or lamba hoany, are used and worn throughout coastal East Africa and Madagascar. Often worn in pairs, these lightweight cloths make a lasting impression not only for their brightly colored designs, but also for the messages that are emblazoned upon them. As early as the 1850s or 1860s, women in the coastal regions of Kenya and Tanzania (perhaps around Lamu or Pate, but most likely in Mombasa or Zanzibar) began buying uncut lineal sheets of six handkerchief squares, called leso in Portuguese, cutting the lengths in half and sewing them together lengthwise to create larger rectangular cloths with two rows of three pattern squares each. By 1875, enterprising merchants in Zanzibar began to import modified leso from England, Switzerland, India, and the Netherlands. Leso eventually also took the name of khanga, possibly because a popular early print included small spots similar to the coloration of the guinea fowl, called khanga in Kiswahili. Around the turn of the century, leso/khanga became especially popular in Zanzibar, appearing at the moment that many former slaves were intent on visually separating themselves from their past and redefining themselves as newly independent, and fashionable, individuals. In the 1920s a merchant named Kaderdina Hajee Essak (nicknamed Abdullah) in Mombasa, Kenya, began adding Arabic script to the lower center section of these brightly colored rectangular cloths. Kiswahili or English phrases in Roman script appeared in the 1960s. Inscriptions incorporate proverbs, popular sayings, greetings, warnings, and political or religious slogans. Use of proverb cloths has since spread along the coast and to the island of Madagascar, with the accompanying text in the appropriate languages. In the middle of the century, textile factories in Africa and Madagascar also began to create proverb cloths for their own markets, although factories in India became dominant cloth-producers for all the regions. Misspellings frequently occur on proverb cloths, probably because many are made abroad for a foreign market in a foreign language. In Madagascar, it is said that lamba hoany must have misspellings to be considered true lamba hoany, suggesting that this is part of their mystique. 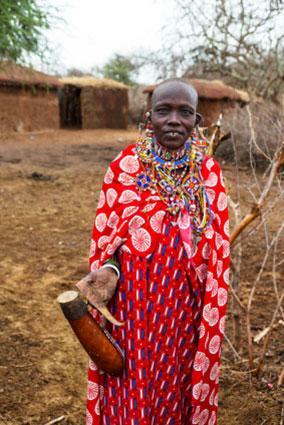 Proverb cloths are traditionally cotton, but are also made of rayon, polyester, or a variety of blends. Generally three feet high by five feet wide, they have a patterned border (approximately five to nine inches deep) surrounding a patterned interior that usually includes a central design, often within a large circular orb, with four smaller versions of the central design in the four corners. Designs, in either bright and showy colors or quieter earthen tones, typically employ two to five colors upon a white base, and may incorporate virtually anything, from genre scenes to a variety of objects from nature or images of technology, or food. Specific designs may or may not correspond to the accompanying text, which is located within a box just below the central motif if there is one and just above the patterned border of the long bottom edge. Lightweight and versatile, proverb cloths are worn primarily by women, although men may also wear them, especially in Madagascar. Often worn in pairs, one may be wrapped around the upper torso and the other worn as a skirt. They can be worn singly as dresses: a girl wrapping the cloth around her body with the two ends over-lapping in front and their upper corners tied behind her neck, a woman wrapping it around her body with the upper edge above her breasts and then either rolled under or over itself or the two upper corners tied in a knot. They can serve as an outer cape to protect one from cold or heat, with the top edge raised over the head to form a hood if necessary. Women often wrap proverb cloths around their waists as a protective layer over their other clothes while working. Proverb cloths can cradle a baby against one's back, with the ends either over both shoulders, under one's arms, or one over and one under an arm, the ends twisted, tied, or held in front. If twisted lengthwise and curled into a flat spiral or doughnut shape, proverb cloths make cushions when carrying a heavy or unwieldy load on one's head. They are often used to wrap objects or parcels, or to cover the contents in a basket. They are also increasingly used as wall hangings, bedspreads, curtains, or seat covers. Finally, in some regions, kangas are essential accessories when attending funerals or weddings. In Tanzania, borders are called pindo, while the ground (or town) is miji, and the four corner motifs (guards of the town) are called vilindo (African Textiles, June/July and August/September, 1984). A person may communicate through a proverb cloth depending on how, where, or when it is worn, displayed, or given. A person can wear a cloth so that the intended recipient of the message may see it, by walking past their house or business, by visiting a neighbor, or by wearing it at home. Messages may warn a gossiping neighbor, a rival co-wife, or an erring husband, or may indicate one's friendship or love. For example, a woman may show her affection by wearing the cloth that her husband has just removed, or she may place her cloth on her husband's pillow to indicate that she would like his attentions. 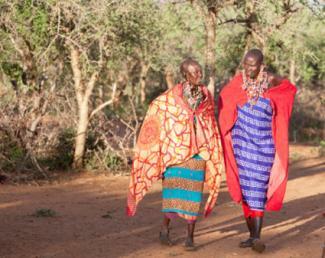 Proverb cloths can also be given as gifts, by one's mother, spouse, parent, grandparent, lover, rival, or friend. Lovers may also send perfumed cloths to emphasize their romantic intentions. Utabaki na chokochoko utaambulia ukoko. "By continuing to create discord, all you'll end up with is just leftovers." Tanzania (Hassan). Kunisalimia tu haitoshi. "It is not enough just to greet me." Kenya (Troughear). Fanahy tsara no maha olona. "A good character makes the person." Madagascar (Green, personal translation). Meanings behind messages, the identity of a message's recipient, as well as the intent of the sender can be ambiguous. However, a person can wear a proverb cloth without intending to send a message, or can wear it with a very specific person(s) in mind. Moreover, the symbolic proverbial sayings may have multiple interpretations or meanings. The responsibility of recognizing a communicative exchange, therefore, rests with the viewer, who must decide whether a message is intentional, and if so, if it applies to him or her. A woman can therefore send a rival or friend a message without risking the social stigma of inciting argument or confrontation, since she can always deny that a message was intended. The woman wearing or giving a cloth, who has the exclusive knowledge of its intent, is therefore in a position of power, and the recipient, who has the disadvantage of not knowing whether a message is intended, is disempowered (see Beck for an extended discussion). Proverb cloths, therefore, are a beautiful yet complex mode of communication and power. See also North Africa: History of Dress; Sub-Saharan Africa: History of Dress. Abdullah, Fatma Shaaban. Kanga Textiles From Tanzania: 1 June-1 July 1984. London: Commonwealth Institute, 1984. Anonymous. "Kanga Textiles from Tanzania." African Textiles (June/July 1984): 5. Anonymous. "Kanga Textiles from Tanzania." African Textiles (August/September 1984): 24-25, 27. Beck, Rose Marie. "Aesthetics of Communication: Texts on Textiles (Leso) from the East African Coast (Swahili)." Research in African Literatures 31, no. 4 (2000): 104-124. Fair, Laura. "Dressing Up: Clothing, Class and Gender in Post-Abolition Zanzibar." Journal of African History 39 (1998): 63-94. Green, Rebecca L. "Lamba Hoany: Proverb Cloths From Madagascar." African Arts (Summer 2003). Hamid, Mahfoudha Alley. "Kanga: It Is More Than What Meets the Eye-A Medium of Communication." African Journal of Political Science, New Series 1, no. 1 (1996): 103-109. Ndwiga, Robert. "Be It Love or Sorrow, Say It With Khangas." The East African (Nairobi) 8, part 2 (2000). Troughear, Tony. "Khangas, Bangles and Baskets." Kenya Past and Present 16 (1984): 11-19. Ali, Hassan. "Kanga Writings." 1995. Available from http://www.glcom.com/hassan/kanga.html . Hanbys, Jeannette and David Bygott. 1984. "The History of Kanga." Available from http://www.glcom.com/hassan/kanga_history.html .